What do you do when your starting pitching staff is only averaging 5 2/3 innings per game, and your bullpen, while featuring a handful of reliable arms, also starts to falter when over-used? The Tigers are on pace to allow 777 runs this season, and for once, seeing triple sevens is not lucky. On the flip side, they are on pace to score 775 runs, and it doesn't take a fancy algorithm to realize that when you finish the season scoring and allowing almost the exact same number of runs, you're looking at a perfectly average win/loss record of 81-81. Offense is hardly a problem this year, but there is room for growth. The Tigers are scoring an average of 4.8 runs per game, and that's above league-average, albeit not by much. But to solve the problem of 775 runs scored and 777 runs allowed, you've either got to reduce the number of runs allowed, or start scoring a lot more runs yourself. 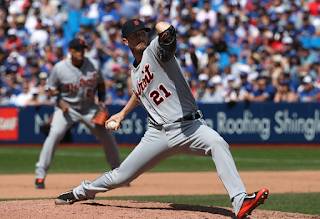 So let's use the Pythagorean Expectation formula to answer two questions: assuming they need to get to at least 86 wins to clinch a wild card spot, how many runs do the Tigers need to score, and how many runs do they need to prevent? We'll start with the pitching. If the Tigers stand pat on their offense and finish the season with 775 runs, they need to allow no more than 729 runs. They've already allowed 427 runs, so basically they can only allow 302 more runs in the remaining 73 games this season. That's an average of 4.14 runs per game. To put that in perspective, the Indians have allowed an average of 4.03 runs per game so far, the Blue Jays are at 4.09, and the Astros are at 4.17 -- it's doable, maybe, but not with this current starting rotation, and not by adding a brown-bag starter from the middle shelf at the trade deadline. Alright, so what about the offense? If we assume the Tigers keep pace and allow the full 777 opponent runs scored this season, they'll need to score at least 826 runs. They've scored 426 so far, so they'll have to score 400 more in the next 73 games, which is an average of 5.47 runs per game. That might sound like a lot, but they're already averaging 4.79 runs scored per game as it is, and that's a number that includes Justin Upton's ridiculously slow start, J.D. Martinez being out of the lineup for endless weeks, most of Cameron Maybin's at-bats going to Anthony Gose to start the season, and the existence of Mike Aviles. The Boston Red Sox are scoring 5.6 runs per game. That's the goal. Some of that gap will be made up with J.D. Martinez returning. He had been worth approximately one run per game, and his replacement in Steven Moya has been worth about half of that. Get J.D. back in action, and you theoretically get that half-run-per-game back. Another thing to remember: the number of runs allowed so far this year may be an unsightly 427, but -- are you sitting down? -- ninety-freakin-nine of those runs were given up by either Anibal Sanchez or Mark Lowe. Yes, that's a 99, a big niner-niner, nearly 25 percent of all the runs allowed, surrendered by just two dudes who were for some reason permitted to continue getting within five miles of a pitcher's mound in both June and July. First, trade Sanchez. Be happy with anything you get in return, even if you end up paying some of his salary. It gets him out of Ausmus's tool box, so it's a net win. Second, get J.D. Martinez back into the lineup and let nature take its course as far as the offense goes. Third, drop a giant cartoon piano on Mark Lowe's head. He'll be fine, he'll just have a few chirping cartoon birds flying around for a bit, but at least he won't be pitching anymore.